Purple is a color intermediate between blue and red. It is similar to violet, but unlike violet, which is a spectral color with its own wavelength on the visible spectrum of light, purple is a composite color made by combining red and blue. According to surveys in Europe and the U.S., purple is the color most often associated with royalty, magic, mystery and piety. When combined with pink, it is associated with eroticism, femininity and seduction. While the two colors look similar, from the point of view of optics there are important differences. Violet is a spectral color – it occupies its own place at the end of the spectrum of light first identified by Newton in 1672, and it has its own wavelength (approximately 380–420 nm) – whereas purple is a combination of two spectral colors, red and blue. There is no such thing as the "wavelength of purple light"; it only exists as a combination. See Line of purples. Monochromatic violet light cannot be produced by the red-green-blue (RGB) color system, the method used to create colors on a television screen or computer display. (In fact, the only monochromatic colors of light that can be produced by this color system are the red, green, and blue that define it.) However, the system is capable of approximating it due to the fact that the L-cone (red cone) in the eye is uniquely sensitive to two different discontinuous regions in the visible spectrum – its primary region being the long wavelength light of the yellow-red region of the spectrum, and a secondary smaller region overlapping with the S-cone (blue cone) in the shortest wavelength, violet part. This means that when violet light strikes the eye, the S-cone should be stimulated strongly, and the L-cone stimulated weakly along with it. By lighting the red primary of the display weakly along with the blue primary, a relatively similar pattern of sensitization can be achieved, creating an illusion, the sensation of extremely short wavelength light using what is in fact mixed light of two longer wavelengths. The resulting color has the same hue as pure violet; however, it has a lower saturation. One curious psychophysical difference between purple and violet is their appearance with an increase in luminance (apparent brightness). Violet, as it brightens, looks more and more blue. The same effect does not happen with purple. This is the result of what is known as the Bezold–Brücke shift. Tyrian purple became the color of kings, nobles, priests and magistrates all around the Mediterranean. It was mentioned in the Old Testament; In the Book of Exodus, God instructs Moses to have the Israelites bring him an offering including cloth "of blue, and purple, and scarlet. ", to be used in the curtains of the Tabernacle and the garments of priests. The term used for purple in the 4th-century Latin Vulgate version of the Bible passage is purpura or Tyrian purple. In the Iliad of Homer, the belt of Ajax is purple, and the tails of the horses of Trojan warriors are dipped in purple. In the Odyssey, the blankets on the wedding bed of Odysseus are purple. In the poems of Sappho (6th century BC) she celebrates the skill of the dyers of the Greek kingdom of Lydia who made purple footwear, and in the play of Aeschylus (525–456 BC), Queen Clytemnestra welcomes back her husband Agamemnon by decorating the palace with purple carpets. In 950 BC, King Solomon was reported to have brought artisans from Tyre to provide purple fabrics to decorate the Temple of Jerusalem. Jesus, in the hours leading up to his crucifixion, was dressed in purple (πορφύρα: porphura) by the Roman garrison to mock his claim to be 'King of the Jews'. In 1464, Pope Paul II decreed that cardinals should no longer wear Tyrian purple, and instead wear scarlet, from kermes and alum,  since the dye from Byzantium was no longer available. 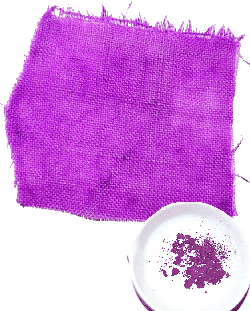 Bishops and archbishops, of a lower status than cardinals, were assigned the color purple, but not the rich Tyrian purple. They wore cloth dyed first with the less expensive indigo blue, then overlaid with red made from kermes dye. During the 1960s and early 1970s, it was also associated with counterculture, psychedelics, and musicians like Jimi Hendrix with his 1967 song " Purple Haze ", or the English rock band of Deep Purple which formed in 1968. Later, in the 1980s, it was featured in the song and album Purple Rain (1984) by the American musician Prince. In color theory, a "purple" is defined as any non-spectral color between violet and red (excluding violet and red themselves). The spectral colors violet and indigo are not purples according to color theory, but they are purples according to common English usage since they are between red and blue. A popular new dye which arrived in Europe from the New World during the Renaissance was made from the wood of the logwood tree (H aematoxylum campechianum ), which grew in Spanish Mexico. Depending on the different minerals added to the dye, it produced a blue, red, black or, with the addition of alum, a purple color, It made a good color, but, like earlier dyes, it did not resist sunlight or washing. 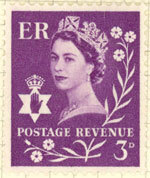 In the 1950s, a new family of purple and violet synthetic organic pigments called quinacridone came onto the market. It had originally been discovered in 1896, but were not synthetized until 1936, and not manufactured until the 1950s. The colors in the group range from deep red to bluish purple in color, and have the molecular formula C 20 H 12 N 2 O 2 . They have strong resistance to sunlight and washing, and are widely used today in oil paints, water colors, and acrylics, as well as in automobile coatings and other industrial coatings. Grapes, eggplants, pansies and other fruits, vegetables and flowers are purple because they contain natural pigments called anthocyanins. These pigments are found in the leaves, roots, stems, vegetables, fruits and flowers of all plants. They aid photosynthesis by blocking harmful wavelengths of light that would damage the leaves. 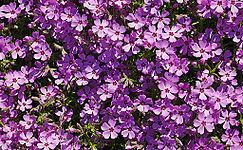 In flowers, the purple anthocyanins help attract insects who pollinate the flowers. Not all anthocyanins are purple; they vary in color from red to purple to blue, green, or yellow, depending upon the level of their pH. Purple Mountain in China is located on the eastern side of Nanjing, Jiangsu Province, People’s Republic of China. Its peaks are often found enveloped in purple clouds at dawn and dusk, hence comes its name "Purple Mountain". The Purple Mountain Observatory is located there. The greater the distance from the eye to mountains, the lighter and more blue they appear. This effect, long recognized by Leonardo da Vinci and other painters, is called aerial perspective or atmospheric perspective. The more distant the mountains are, the less contrast the eye sees between the mountains and the sky. In the Latin Rite of the Roman Catholic liturgy, purple symbolizes penitence; Catholic priests wear a purple stole when they hear confession and a purple stole and chausible during Advent and Lent. Since the Second Vatican Council of 1962–5, priests may wear purple vestments, but may still wear black ones, when officiating at funerals. The Roman Missal permits black, purple (violet), or white vestments for the funeral Mass. White is worn when a child dies before the age of reason. Students and faculty of theology also wear purple academic dress for graduations and other university ceremonies. In Chinese astrology the North Star was the home of the Celestial Emperor, the ruler of the heavens (As noted above, the area around the North Star is called the Purple Forbidden Enclosure in Chinese astronomy.). For that reason the forbidden city in Beijing was also known as the purple forbidden city (zi Jin cheng ). The color purple plays a significant role in the traditions of engineering schools across Canada. This fascination with purple is commonly attributed to the story of the sinking of the Titanic, in which the purple-clad Marine Engineers remained on board to delay the ship's sinking. Purple is also the colour of the Engineering Corp in the British Military. It is common for engineers across schools in Canada to dye themselves (and their leather jackets, in the case of Queen's University engineers) purple using the medical dye Gentian Violet, especially during events such as Frosh Week.
" Purple Haze " is one Jimi Hendrix's most popular songs.
" The Purple Bottle " is a song by Animal Collective. Purple is sometimes associated with the lesbian, gay, bisexual, and transgender (LGBT) community. It is the symbolic color worn on Spirit Day, a commemoration that began in 2010 to show support for young people who are bullied because of their sexual orientation. Purple is closely associated with bisexuality, largely in part to the bisexual pride flag which combines pink – representing homosexuality – and blue – representing heterosexuality – to create the bisexual purple. The purple hand is another symbol sometimes used by the LGBT community during parades and demonstrations. Oxford English Dictionary On-Line. "Definition of purple". Webster's New World Dictionary of American English(Third College Edition) defines it as: "A dark color that is a blend of red and blue." Sadao Hibi; Kunio Fukuda (January 2000).. Kodansha International. ISBN 978-4-7700-2536-4.
. What is the Wik. Friar, Stephen, ed. (1987). "A New Dictionary of Heraldry". London: Alphabooks/A&C Black. p. 343. ISBN 0906670446. Eva Heller, Psychologie de la couleur: effets et symboliques.
. Web.forret.com . Retrieved 2012-12-29 . Shorter Oxford English Dictionary, 5th Edition, 2003. P. U.P. A Gilbert and Willy Haeberli (2008).. Academic Press. p. 112. ISBN 0-12-374150-5. Louis Bevier Spinney (1911).. Macmillan Co. Le Grand Robert de la Langue Française(2001). Eva Heller,Psychologie de la couleur: effets et symboliques, image 69 in French edition. Liv. xxiv. 7, 2. As cited byThe Dictionary of Greek and Roman Antiquities. cf. Cic.post red. in Sen.5, 12. As cited byThe Dictionary of Greek and Roman Antiquities. cf. Liv. v. 41, 2. As cited byThe Dictionary of Greek and Roman Antiquities.
. Mmdtkw.org . Retrieved 2012-12-29 . Suetonius (121).. Loeb Classical Library (in Latin and English). Translated by Rolfe, John Carew. Heinemann (published 1914) . Retrieved 2017-03-28 . Annalisa Marzano (1 August 2013).. OUP Oxford. p. 150. ISBN 978-0-19-967562-3. John Gage (2009),La Couleur dans l'art, p. 148–150. Varichon, AnneColors:What They Mean and How to Make ThemNew York:2006 Abrams Page 140 – This information is in the caption of a color illustration showing an 8th-century manuscript page of the Gospel of Luke written in gold on Tyrian purple parchment. Eva Heller,Psychologie de la couleur: effets et symboliques, p. 165. Elena Phipps,Cochineal red: The art history of a color, p. 26. Garfield, S. (2000). Mauve: How One Man Invented a Colour That Changed the World. Faber and Faber, London, UK. ISBN 978-0-571-20197-6. Eva Heller,Psychologie de la couleur: effets et symboliques, image 75–76. MoreOrLess.. Cesnur.org . Retrieved 2012-12-29 . Charles A. Poynton (2003).. Morgan Kaufmann. ISBN 1-55860-792-7. John Dakin and Robert G. W. Brown (2006).. CRC Press. ISBN 0-7503-0646-7. Anne Carichon (2000),Couleurs: pigments et teintures dans les mains des peuples. p. 133. Isabelle Roelofs,La Couleur Expliquée aux artistes, 52–53. Anne Carichon (2000),Couleurs: pigments et teintures dans les mains des peuples. p. 144. Hubner K (2006). "History: 150 Years of mauveine". Chemie in unserer Zeit. 40 (4): 274–275. doi:. Anthony S. Travis (1990). "Perkin's Mauve: Ancestor of the Organic Chemical Industry". Technology and Culture. 31 (1): 51–82. doi:. JSTOR. D.A. Bryant & N.-U. Frigaard (November 2006). "Prokaryotic photosynthesis and phototrophy illuminated". Trends Microbiol. 14 (11): 488–96. doi:. PMID.
. Livescience.com. 2007-04-10 . Retrieved 2012-12-29 . Barnett, Lincoln and the editorial staff of LifeThe World We Live InNew York:1955--Simon and Schuster--Page 284 There is also an illustration of Purple Pleione by the noted astronomical artist Chesley Bonestell. ". "Encyclopædia Britannica. 2007. Encyclopædia Britannica Online. 16 Nov. 2007. Eva Heller,Psychologie de la couleur: effets et symboliques, p. 162. Joint Service handbook of the U.S. Army War College, Carlisle, Pennsylvania.
. Northwestern University . Retrieved 2011-06-10 . 2006-09-08 at the Wayback Machine. 2007-06-19 at the Wayback Machine.
. Crwflags.com . Retrieved 2012-12-29 . All information for Purple's wiki comes from the below links. Any source is valid, including Twitter, Facebook, Instagram, and LinkedIn. Pictures, videos, biodata, and files relating to Purple are also acceptable encyclopedic sources. "web.Forrett.com Color Conversion Tool set to color #8F00FF (Electric Violet):"
"Tyrian Purple in Ancient Rome:"
"Bibelforshcer—The German name for "Jehovah's Witnesses":"
"Early Earth Was Purple, Study Suggests:"
"English Funeral and mourning clothing"
"prince.org: where fans of Prince music meet and stay up-to-date"
"Behind Northwestern's Songs: Northwestern University"
"Wear Purple October 20: Spirit Day, Wear Purple Day"
"Legendary "Purple Banner of Castile" or "Commoner's Banner":"
Other wiki pages related to Purple.